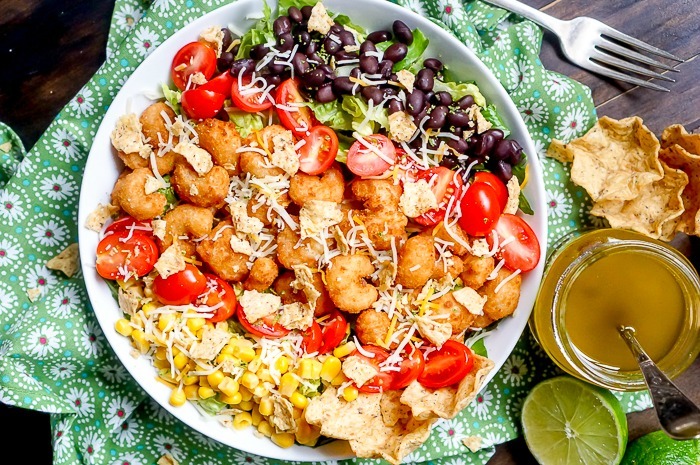 Crispy Shrimp Taco Salad with Honey Lime Vinaigrette Dressing makes a super easy weeknight dinner for National Seafood Month that’s fresh and tasty! Last month, I shared with all of you a recipe for CREAMY CRAB RANGOON DIP WITH HOMEMADE WONTON CHIPS. It’s a perfect recipe for game day or upcoming holiday parties! It’s also part of our Healthy Heart Pledge with Seafood Nutrition Partnership which means we are eating more seafood and supplementing with Omega-3s. Eating seafood twice a week can supports your heart and brain health which is definitely worth the effort of finding new seafood recipes to include into our routine. 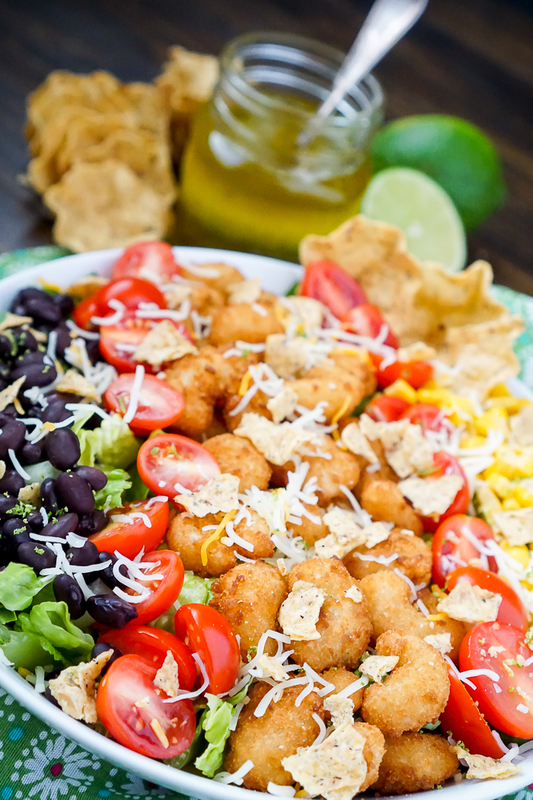 Enter this super easy Crispy Shrimp Taco Salad. I promised you all another easy seafood recipe and here it is for National Seafood Month! This salad is the perfect dinner idea to have as a stand by because it is so fast to pull together. Convincing Bryan to eat seafood is easy; convincing him to eat a salad is a much tougher sell. 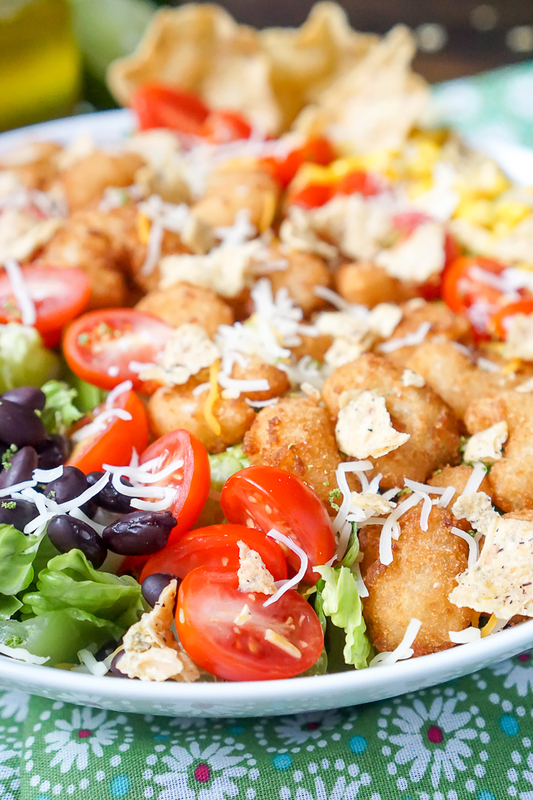 He was all about this Crispy Shrimp Taco Salad though because he loves popcorn shrimp so much! Plus it paired so well with my Honey Lime Vinaigrette that we love. This is definitely being added to our normal routine. It tasted delicious, it’s very customizable, and it’s super easy to throw together which makes it a perfect weeknight dinner. While the shrimp cooked in the oven, I cut up the lettuce, tossed in some of our favorite toppings that we had on hand, and even decided to whip up my Honey Lime Vinaigrette so we had a light, refreshing salad dressing on hand. Then, when the shrimp was done, I tossed it on top, and we were ready to go. It doesn’t get much better than that, right?! Cook popcorn shrimp based on the box instructions. Prep the rest of the salad (and the dressing if you decide) while the shrimp cooks. In 15 minutes, dinner was ready, and we were sticking to our Healthy Heart Pledge with Seafood Nutrition Partnership. The USDA recommends eating seafood twice a week, and studies have found that eating fish literally saves lives. An estimated 50,000 deaths from heart disease and stroke are avoided per year by eating fish. Those are pretty compelling reasons to add more seafood into a weekly diet. Seafood can really intimidate home cooks, but it doesn’t have to! 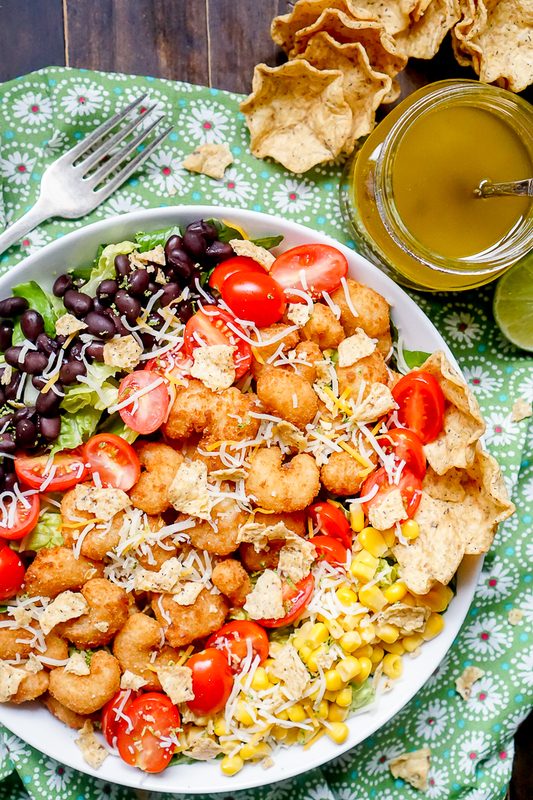 Just look at how easy this Crispy Shrimp Taco Salad is or how quick my Creamy Crab Rangoon Dip comes together. Make sure you check out the Seafood Nutrition Partnership 2016 Recipe Sweepstakes which is running through October 21st. To enter, share a photo of your seafood dish that uses 5 ingredients or less (not including spices or garnishes) on Twitter or Instagram using the hashtags #HealthyHeartPledge and #SNPSweepstakes. A total of ten winners will be randomly selected to win a $250 gift card. Winners will be announced at SNPSweepstakes.com and on Instagram and Twitter, so you will want to make sure you are following along.